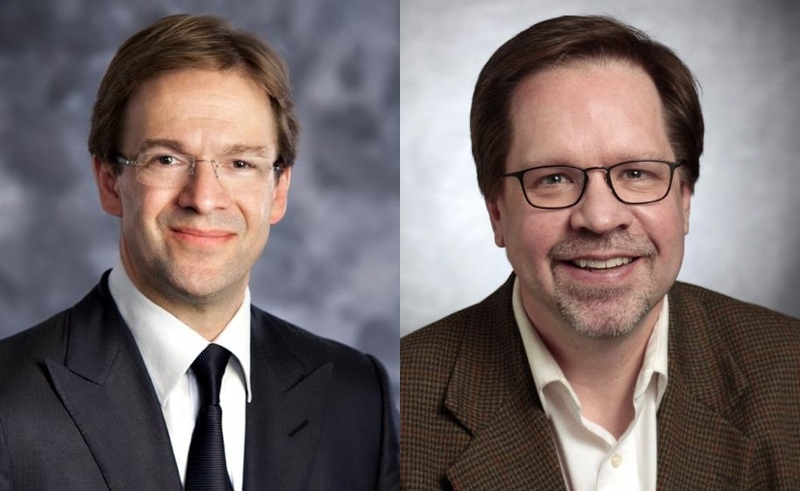 Did Abele, Newspaper Cover Up Schmidt Pension? Decisions by county exec, Journal Sentinel, suppressed news of his lucrative pension. Chris Abele and Dan Bice. But Abele is also a well-known critic of the infamous Milwaukee County pension backdrop, which has cost the county $300 million to date and will likely hit $400 million before every employee eligible for it collects the lucrative lump sum payout. That has caused huge fiscal problems for the county, contributing to the decline of the county parks, the bus system and other cutbacks in services. So you might think Abele would want to alert voters that the election of Schmidt in the race for county sheriff would have significant financial consequences, encouraging a man already eligible for retirement (who now says he’ll retire by January) to continue working and driving up the value of his pension by more than half a million dollars. Yesterday Journal Sentinel columnist Dan Bice reported that Schmidt’s backdrop pension was already worth more than $810,000 by April 2017, based on its growth (driven by compounded interest) over the 8.5 years since he was first eligible for retirement, in October 2008. The estimate is undoubtedly wrong; it was made in response to Schmidt’s request by Marian Ninneman, the county’s former Retirement Plan Services director, who resigned under fire after overseeing many errors in pension computations and it seems too high. Still, it shows Schmidt knew he was in line for a huge backdrop payment. And given that Schmidt was one of the county’s better paid and more veteran employees, Abele would have known the acting sheriff was likely to get a generous payout. I contacted Abele’s office to ask whether the county executive ever asked Schmidt what his backdrop was before deciding to back him in the race for sheriff. Abele declined to answer the question. Did he ever ask the pension office to do an estimate? No, he says. Did he already know about the county pension office estimate of Schmidt’s backdrop? No, he says. It’s fair to say Abele was very uninterested in an issue — the amount of Schmidt’s pension payout — that was getting widely discussed by employees in the sheriff’s department. Then there’s the fact that Bice requested a copy of the pension estimate done for Schmidt three weeks before the election and didn’t get a response from the county until after the election. Bice shared emails from Tim Coyne, the current Director of Retirement Plan Services for the county, who promised to get Bice a copy of the document before the election. But it didn’t arrive until after the election. Did Abele, who spent $300,000 in an attempt to elect Schmidt, ask for this delay? His spokesperson Karina Henderson emphatically denies this. Bice has a checkered history covering the Milwaukee County pension problems. Bice and his then co-columnist Cary Spivak were taken to task in a Pressroom Confidential column for Milwaukee Magazine by Peter Robertson for ignoring the stories I did for Milwaukeeworld.com blowing the lid on the county backdrop plan. It was only after I free lanced a longer feature story on the pension plan for the magazine — months later — that the Journal Sentinel assigned a team of reporters to the story. In the case of Schmidt’s pension, Bice tells me he learned Schmidt had made speeches earlier this year saying he had contacted county pension officials to get an estimate of his pension. Bice asked Schmidt in mid-June what the estimated amount of his backdrop pension was and Schmidt refused to say. More than a month later, in late July Bice contacted the county to get a copy of the estimate sent to Schmidt. On August 8 I did a story revealing for the first time that Schmidt was in line to get a huge lump sum pension backdrop. I made it clear this was just an estimate since I lacked some pertinent information, but that my calculations suggested he could get anywhere from $596,000 to $834,000, depending on the details of his employment. At that point the only way Bice could be sure Schmidt was getting a “six-figure backdrop” was from my story. Bice, however, tells me that after my story ran “I was told by two individuals in off-the-record conversations to avoid using your ‘bar napkin calculation. '” Except that these alleged experts estimated the real value of Schmidt’s backdrop was “closer to $700,000 or $800,000,” Bice says — which puts it right in line with the estimate in my story. That could have given Bice even more to include in a follow-up story. Instead Bice waited to get the document from the county on Schmidt’s pension and it never arrived. And so he never told voters the information they should have heard: that Schmidt had stonewalled the paper and refused to divulge the amount of his estimated pension. The decisions of Bice and Abele helped assure that the state’s largest newspaper, which many other media outlets still see as a guide to what news to cover, did not reveal the truth about Schmidt. As for yesterday’s document Bice reported, it is simply an estimate and a bad one at that. The document sent to Schmidt says “These figures are estimates and will change when the final calculation is determined.” And no, Bice didn’t quote this in his story. Nor did he note the huge number of errors on Ninneman’s watch. That might have raised questions as to why he didn’t report the estimate in my story. The documents sent by Ninneman to Schmidt says he gets a 2.5 percent pension credit for each year served. (I had used a 2 percent multiplier in my estimates, taking the most conservative approach.) By the date he was first eligible for retirement under the county Rule of 75, on October 4, 2008, Schmidt had served 22.33 years, which multiplied by 2.5 equals 55.825, which means he gets just over 55 percent of his final average salary of about $97,000 for his pension payment at that point. That’s just over $54,000 or $4,512.52 per month. But the estimate for Schmidt from Ninneman shows he would get $6,068.52 per month. That’s way too high. It’s possible she thought Schmidt was eligible for the 25 percent bonus that went to employees hired before 1982, but Schmidt was first hired in 1986, and even that wouldn’t push the monthly payment that high. So if you use this inflated figure and check a compounded interest calculator, you do come very close to the $810,000 figure in the estimate of Schmidt’s backdrop payment as of April 2017. But if you use the figure that actually follows the county formula, giving Schmidt just over $4,512 per month, you get a backdrop that’s much lower: just over $601,000. A year later, by the time Schmidt was pushing to get elected sheriff, that had grown to more than $706,000, and should he have won the election and served till December 2022, that amount would have grown to just over $1,370,000. In short, Schmidt’s defeat (he now says he will retire in January) has saved the taxpayers some $664,000. Too bad the readers of the Journal Sentinel, or the consumers of Abele’s ads touting Schmidt, had no inkling of this. Thx for doing this update. The backdrop #s still boggle the mind. Imagine that # invested in our parks, senior programming, bus routes, etc. Bruce, I think you do a great job and I enjoy your columns. I also agree that the whole pension deal approved years ago was a major fiasco and the mistake that keeps giving for Milwaukee County taxpayers (like me). However, Richard Schmidt had nothing to do with the pension deal and is simply an honorable public servant who has been an excellent Acting Sheriff and would have made a fine permanent Sheriff. We were lucky to have (at least) two excellent people running for Sheriff after the man we had on the job for the last 10 years. So rather than focus on the pension benefit he would have received for another four years on the job (or his religious beliefs) I would like to thank Richard Schmidt for his many years of service to Milwaukee County and wish him well in retirement. At the same time I congratulate Earnell Lucas and wish him well as our new Sheriff.